On 22nd June 1941, the Wehrmacht launched its invasion of the USSR under the code name Operation Barbarossa. Between 22nd June and 4th July 1941, the German’s massive invasion force consisted of 138 divisions, approximately 3 359 000 men, 4 445 fully tracked AFVs of all types, and 3 914 aircraft of all types. The German force was divided into three Army Groups, an OKH (high command) reserve and a small force in North Norway/Finland. Army Group North (initially 29 divisions) was tasked with invading the Baltic States and the eventual capture of Leningrad. Army Group Centre (52 divisions) was assigned the invasion of Byelorussia, with the objective of capturing Minsk, Smolensk and ultimately the Moscow-Gorki space. Army Group South (41 divisions) was tasked with invading the Ukraine, capturing Kiev, crossing the Lower Dnepr River and securing the Crimea. Complementing this force in July 1941 were 16 Finnish, 2 Slovakian, 3 Italian and 15 Rumanian divisions, and 12 Hungarian brigades. All these forces (except the Finns) supported Army Group South in its drive East in 1941. (Refer to The Belligerent’s Forces June-July 1941: German Forces for more detail on German forces). In addition the Reserves of the STAVKA GK with 6 armies were positioned in or near these districts to act as a third echelon counter-attack force and mobile reserve. On 22nd June the Red Army and VVS had 228 (including 50 tank and 25 mechanised) divisions in the Western Military Districts and Stavka Reserves, with approximately 3 310 000 men, 15 470 tanks and 10 775 combat aircraft. The strongest military district by far was the Kiev Special Military District with 58 (including 16 tank and 8 mechanised) divisions, 907 000 men, 5 465 tanks and 2 059 combat aircraft (excluding Stavka reserves already in the district). This was where the Stavka expected the main thrust of any German attack to occur. 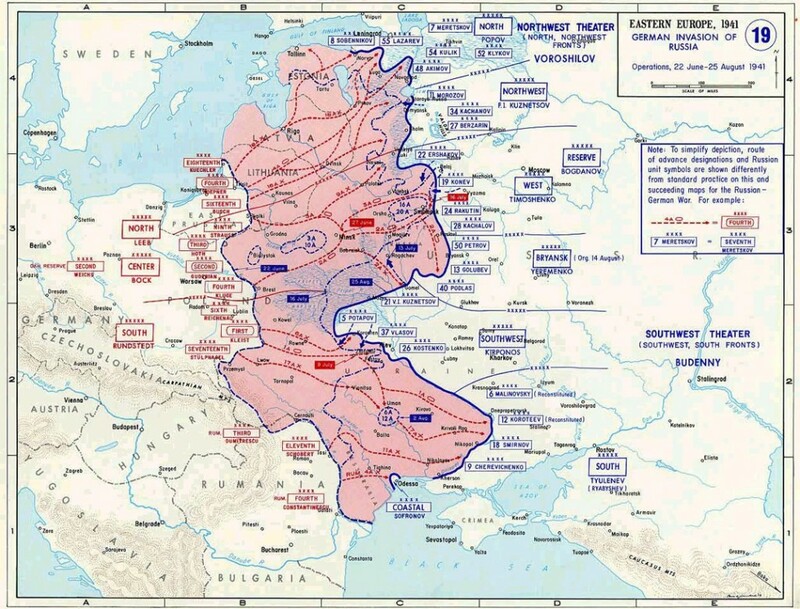 (Refer to The Belligerent’s Forces June-July 1941: Soviet Forces for more detail on Soviet forces).